Bone is a living material composed of cells and an extracellular matrix (ECM) that has a multi-component structure . The ECM of bone is composed of three phases: an inorganic mineral phase, an organic phase, and an aqueous phase. The inorganic phase of bone is calcium hydroxyapatite, Ca10(PO4)6(OH)2. The organic phase consists primarily of collagen fibers and associated noncollagenous ECM proteins. The molecular configuration of collagen provides binding sites for hydroxyapatite crystal nucleation and growth. The ECM is created and maintained by active bone cells: osteoblasts, osteoclasts, and osteocytes. 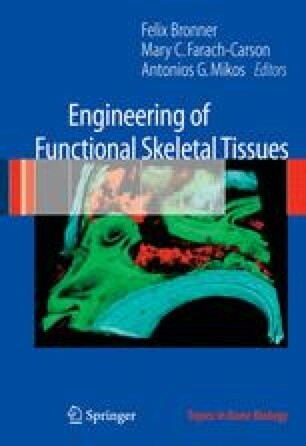 Osteoblasts and osteocytes are involved in bone formation and maintenance, respectively, whereas osteoclasts promote resorption of bone , . Bone is, in general, dynamic and constantly being remodeled by the action of these cells, and thus can regenerate itself.